Discover the place where rural and sophistication meet in the Okanagan Valley. It is a place of rolling hills of orchards and vineyards, winding country roads, hiking trails and spectacular natural landscapes. You will also find wineries, architecture, artisans, First Nation heritage, culinary delights and familiar stores for convenient shopping. We invited you get off the beaten path, take the road less travelled and discover the best kept secrets and local treasures of our communities. To learn more, visit Visit Westside. The Westside Wine Trail is first and foremost a wine touring destination. The West Kelowna Vintners Association is the association that markets and promotes the Westside Wine Trail and they aim to create memorable wine touring experiences for visitors to the area. When touring the Westside Wine Trail, visitors can expect to experience tasting rooms, restaurants, art showings, live music performances, culinary classes, special events and luxury accommodation in the form of resorts and Bed & Breakfasts. The Westside Wine Trail, hosts three Signature events each year, known as their ‘Sip Series’ events. 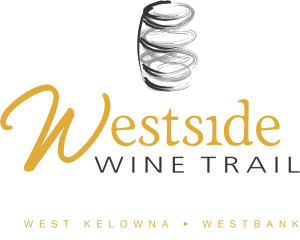 The wineries of the Westside Wine Trail are located in the Central Okanagan region of British Columbia. 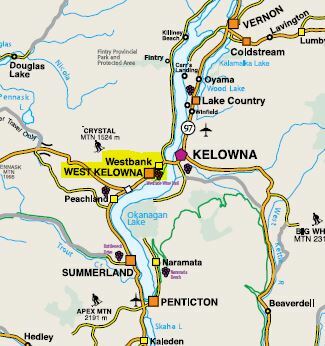 The Westside Wine Trail is a mapped out route of wineries within the District Municipality of West Kelowna, which rests on the western shores of Lake Okanagan. The trail is an 11 km route with the majority of the wineries being within walking distance of each other. The northern starting part of the Westside Wine Trail is a mere 10 minutes from downtown Kelowna with the southern point of trail being 40 minutes from Penticton.